Even though it’s only October, holiday décor is already out in the stores, so I figure we might as well get a jump start on good ole’ Thanksgiving. As I’ve flipped through some magazines, I have come across so many awesome recipes that I could not resist sharing with you all! The following recipes come from a fabulous site called www.spoonful.com. There are some seriously fabulous recipes on this site, along with great pictures. Below are some of my favorites from the site that are super cute! 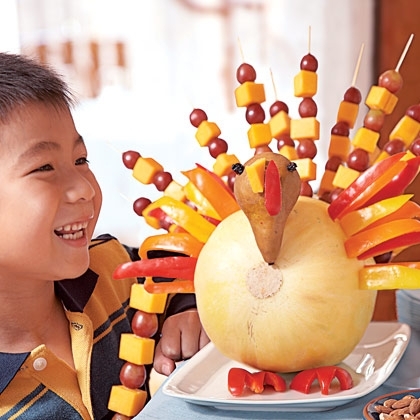 I can’t wait to try these out this Thanksgiving! Here’s a treat that looks old-fashioned but is made with two favorite modern-day sweets: marshmallows and chocolate. 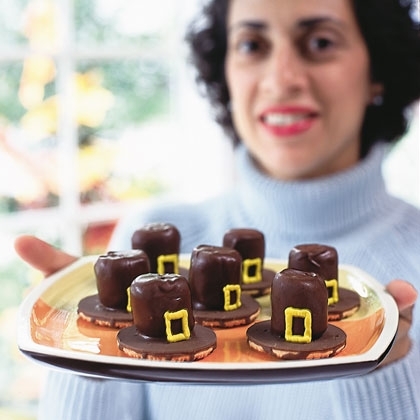 Chill the hats until the chocolate sets, then pipe a yellow decorators’ frosting buckle on the front of each hat. We used half an Oreo cookie for each body and an entire cookie for each tail, then used a dab of royal icing to affix Whoppers for heads. We piped on icing eyes and also used icing to affix the candy corn feathers and beaks. Frost a third or so of a plain or glazed doughnut hole with chocolate frosting or peanut butter. Roll the frosted top in crumbled toffee (look for it in the baking section of grocery stores), then add a small piece of a pretzel for the stem. 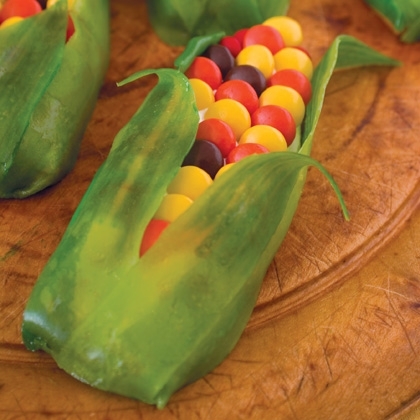 It’s easy to assemble — and delicious to take apart! Stabilize the melon body by cutting a shallow slice off the rind to form a flat base. Using a section of bamboo skewer, attach a Bosc pear head to the melon, as shown. Aren’t these recipes fun!?? 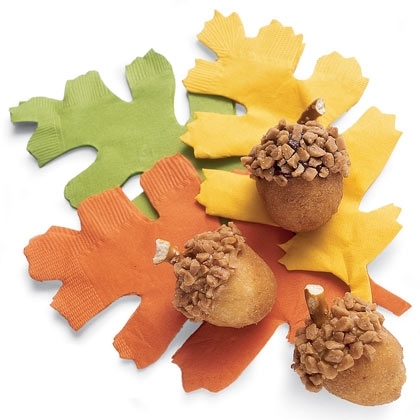 Do you have any favorite cute Thanksgiving treats? Do share! This entry was posted in Activities, Cooking, Fall, Food, Holidays, Shannon Boatwright and tagged Columbia, columbia sc, every woman blog, Fall, Famously Hot, food, Holidays, hospital blog, Lexington, lexington medical center., lexington sc, Lexington Women, lmc, LMC every woman blogger, Midlands, Midlands Women, Recipes, shannon shull, South Carolina, South Carolina Women, Thanksgiving, Women, women's blog, women's hospital blog by Kate Gillmer. Bookmark the permalink.